and the government will be on shoulders. As I read each name Jesus was given in this verse, I considered how I might praise Him for who He is. My devotional time evolved into a beautiful time of thanking Him for His greatness expressed in His names. Wonderful Counselor ~ Christ is the source of all truth. He knows everything about me. His love for me is never ending. He sympathizes and understands all my weaknesses, fears and failures. He welcomes me to talk to Him and release my burdens to Him. He provides me with help and guidance. He knows everything about me. He is the creator of wisdom and in Him I find all I need. He is the only one I can trust to rule my life. Mighty God ~ He is the only one who can redeem me, forgive my sin, defeat Satan, liberate me from the power of evil, answer my prayers, and restore brokenness within me. Nothing is too difficult for Him. He is never overwhelmed. He is able to meet all my needs. He is strong enough to break down the hardest of hearts and still love gently. Storms cease at His command. Everlasting Father ~ Nothing is too complex for the Creator of this world and Sustainer of all within it. He is the Alpha and Omega – the First and the Last – the Beginning and the End. He is timeless and His love knows no end. His love is unconditional. He will always be faithful to me. He is always present. He will never leave me or forsake me. 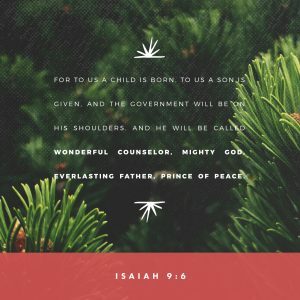 Prince of Peace ~Through Jesus’ death on the cross, He reconciled us to God and opened a way for us to have a relationship with Him- a relationship that brings the precious gift of peace into our lives. His presence brings peace right into the midst of my troubles, disappointments, pain and sorrows. He calms me as I trust Him, no matter what is going on around me. He provides me with peace that is beyond my understanding. 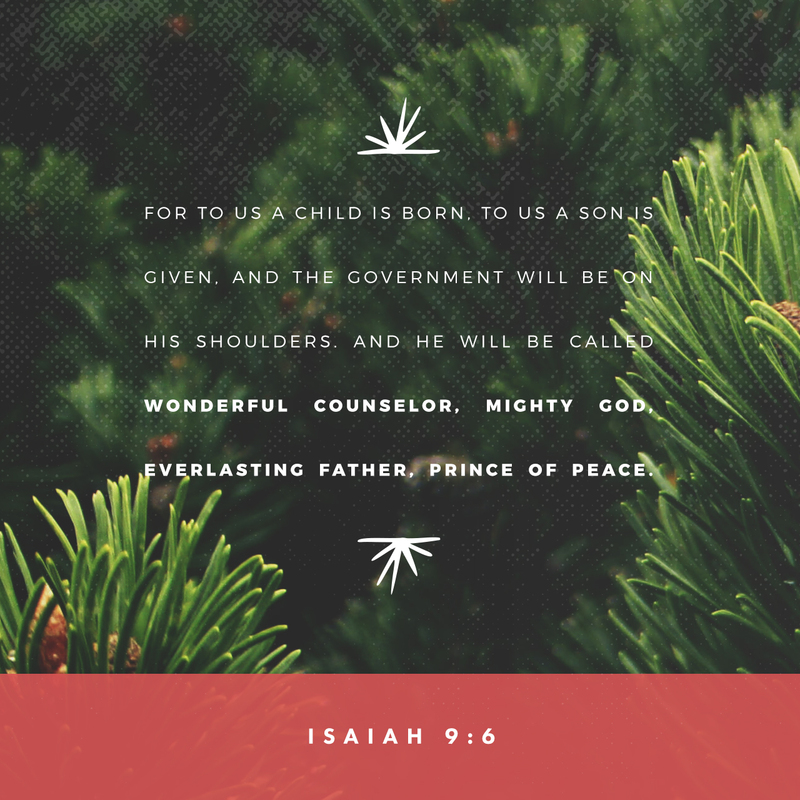 Take a few minutes today to worship Him for the ways He is your wonderful Counselor, your Mighty God, your Everlasting Father and your Prince of Peace. Bring an offering of praise to your King, for you have been given a glorious gift! Truth Tuesday will return in January 2018. I am taking a few weeks off to enjoy time with my family. Thank you Kathy…Merry Christmas to you as well.